Cashiers, law enforcement personnel, financial workers, and even schoolchildren must be aware of the severity of domestic security threats and how best to resist and react to scenarios involving armed thieves or active shooters. Scenarios involving active shooters are typically over within 10 – 15 minutes, which means that individuals must be made aware of how to respond before law enforcement arrives at the scene. The most efficient way to protect vulnerable individuals is to provide a level of passive ballistic security such as bullet-resistant glass. What is Ballistic Security Glass? Glass is brittle and hard, which means it cannot deform in response to localized impacts. Bullets will pass through regular commercial windows with little to no loss of energy, providing no ballistic security for individuals in the line of fire. Bullet-resistant glass is often fabricated as a laminate or composite material comprised of multiple alternating layers of glass and plastic. These materials can also be used independently. Reinforced 100% glass can be engineered for ballistic security while other bulletproof products are made entirely from polycarbonate or acrylic. Typical polymers used in a glass laminate include ethylene-vinyl acetate (EVA) or polyvinyl butyral (PVB), which serve to hold layers of glass together following a break. Rather than pass rapidly through a single pane of glass, a bullet’s energy dissipates through the layers, slowing it to a stop. This provides enhanced levels of ballistic security for individuals operating cash desks, ticket booths, and customer-facing desks. Unfortunately, the term ‘bullet-proof’ is something of a misnomer. There is no way to ensure that ballistic security glass is impervious to all the domestic security threats of today. Most bullet-resistant glass offers substantial protection against small arms fire such as a 9 mm or .357 Magnum, but repeated impacts will gradually reduce the integrity of the product. This could cause spalling, where shards break free from the structure, or subsequent bullets to penetrate the laminate. Security levels for ballistic security systems have been put in place by the Underwriters Laboratory (UL), which has tested various glass composites against projectiles of different calibers. Generally, the usual requirements of banks and convenience stores are covered by levels 1-3. One of the primary challenges of engineering bullet-resistant windows is that ballistic security is merely one of the product’s mandatory functionalities. In many instances, they must also be integrated with passive voice transmission to ensure that employees and customers can communicate with one another easily. Bank tellers, for example, must be able to speak with customers in as natural a manner as possible. Employees operating ticket booths must be able to conduct transactions in a safe environment, requiring some form of aperture for receiving cash and handing over tickets. Architects must also consider the materials used to frame the glass to ensure optimal ballistic security. Typical steel and metal alloys are used for bullet-resistant windows, but these represent an additional threat in the form of ricochets. 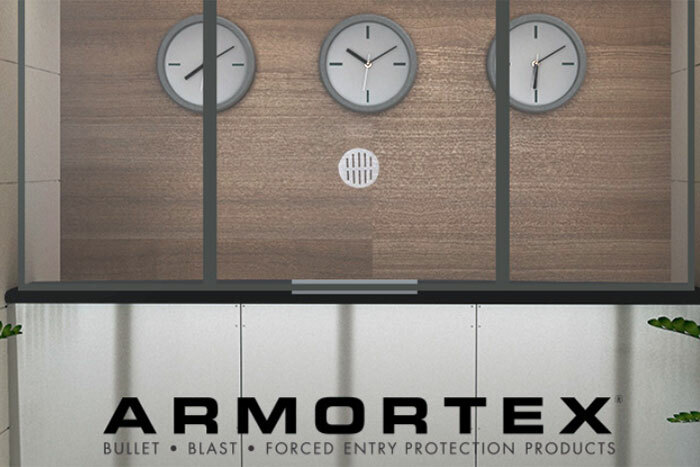 Armortex has been manufacturing bullet-resistant windows for over three decades, with extensive experience serving architects and contractors designing courtrooms, government offices, convenience stores, police stations, and much more. We can improve your ballistic security with bullet-resistant windows and glass augmented for specific applications with pass-through transaction equipment and secure speakers. If you would like any more information about our window products, please do not hesitate to contact us. To request more information from Armortex, please complete the form below.